Have you gone to the website of your local hospital this year? You will notice it now posts a list of their standard charges online. Under federal law, hospitals are required to make their standard charges public. However, the Centers for Medicare and Medicaid Services wanted to encourage price transparency and accessibility for patients. So effective Jan. 1, CMS requires those prices to be posted online. 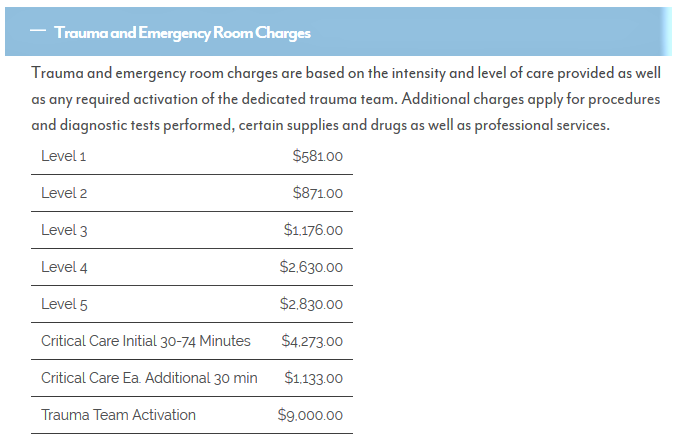 This is the Summary Price List of Trauma and Emergency Room charges on the ECMC website. Other hospital departments are also listed. ""We believe that it is a step in the right direction to understanding the complexities of pricing in the healthcare environment," said Lisa Cilano, Senior Vice President for Revenue Management and Business Advisory Services for Catholic Health. "The initial impact on the community, to the consumer, I think is going to be confusion." She said charges are now posted online, but in health care, charges don't equate to what patients ultimately pay. "That is really dependent upon several factors, including whether or not the consumer has insurance, whether or not they completely undertsand what settings their service is going to be provided in, what type of services they're going to have done and the unknown, so the complexities or complications that may come up during the stay could change what is expected to be paid substantially." "All the range of services that we have available here in the hopsital are posted and the cost range for those services is available on our website. It's in our 'Patients and Visitors' section on the ECMC website," said Erie County Medical Center Director of Communications and External Affairs Peter Cutler. Cutler said what is important to recognize is that patients will find a range of prices and those prices will be for hospital services. "What everyone should understand and know is that there are other charges a patient would incur during the course of their treatment, for instance, from their physician. That would be separate," he said. Let’s take, for example, a knee replacement. Cilano said what patients end up paying depends on many things. Cilano advised patients to not be overwhelmed. Pickup the phone and call Catholic Health. She said it has a team of specially trained staffers who can advise on all types of billing questions. "We have a very robust healthcare assstance program and charity care program, where a patient who presents to our facility and is looking for or not even presenting yet, but looking for what it costs to have that knee replacement," Cilano said, "they can contact us directly and we will walk through with them, based on their financial information, what we can do to give them the right cost for the services provided." Ditto from Cutler at ECMC. "We have a phone number on our website in the section that posts all this information, the staff from 8 a.m.-4 p.m. Monday-Friday and that number is 716-898-3272," Cutler said. "And there's also an email address related to this and that's priceinfo@ecmc.edu. Patients can go to that to get further explanation or information about the cost of services here, while they're in our care." He said the hospital is also advising patients to consult their physicians and insurers to help understand the total charges they may be billed for a service. "Clearly, you know, health care is a complex environment in and of itself and our goal is to break through that for the patients that we serve and make it as understandable and digestable as possible," Cutler said. Both Cutler and Cilano said their hospitals have not seen an increase in calls asking for more information yet, but they expect to, as patients become aware of the new online resource.